In 1982 the former GM assembly plant in Fremont CA was a shuttered, abandoned complex on 211 acres near San Francisco. The former Buick line had been plagued by low morale and a reputation for poor quality. Since the plant's rebirth in 1984 as the Toyota/GM partnership New United Motor Manufacturing Inc., nearly 5 million vehicles have crossed the finish line. Quality standards have become so high that NUMMI is now shipping the first US-manufactured vehicle designated exclusively for export to Japan, targeting the world's most discriminating auto buyers. Flaunting recent assumptions in manufacturing strategies, NUMMI has achieved continuing profitability in one of the most high-cost areas of the USA. When the partnership was founded, GM provided the capital and Toyota brought the reputation as the world's most proficient auto company. The Toyota Production System (TPS) is the envy of the industry and applies not just to manufacturing but also to almost everything Toyota does, from product development to supplier relations and distribution. Toyota sets the standard in efficiency, productivity, and quality, and the NUMMI plant continues to consistently rank near the top of all domestic plants in these categories. On the surface, TPS appears simple: maximize flow, eliminate waste, respect people. But while TPS in concept isn't complicated, its implementation and coordination requires a different mindset. TPS has been described as having three levels: techniques, systems, and philosophy. The underlying key to the success of TPS is the philosophy and practice of kaizen. A term of Japanese origin, kaizen roughly translates as "continuous improvement". Underlying this concept is an understanding that regardless of how well a process seems to be performing, there is always a better way. Bob Daly, Group Vice President of Toyota Customer Services, puts it this way: "The predominant theme of this principle is doing everything a little better each day. But kaizen involves a variety of thought processes and business practices, and all of them stem from the attitude of humility. An attitude of humility means we have accepted that our work has imperfections and that everything we do can be improved." TPS in action is a thing of beauty. A Toyota assembly plant fairly hums. Every movement has a purpose and there is no slack. At Toyota, production is choreography: retrieving parts, installing them, checking the quality, and doing it all in immaculate surroundings. The plant has the full gamut of components of an auto assembly operation: Plastics, Stamping, Body & Weld, Paint, and Assembly. Production began with the Nova, but the plant really hit its stride with the introduction of the Corolla FX16 in 1986. Two main assembly lines now operate at full capacity over two shifts. The truck line produces a new Toyota Tacoma compact truck every 83 seconds, in three models. The passenger car line produces a Toyota Corolla, Pontiac Vibe, or Toyota Voltz every 60 seconds. Major retooling of the passenger car line was completed in 2001 for the model launch of the Vibe and Voltz. The Voltz is a derivation of the Vibe for export to Japan, with right-hand drive, labels in Japanese, and other modifications intended for the discriminating Japanese customer. NUMMI operates as a custom mass production assembly plant. Multiple models can be produced on a single line, and all models are built from dealer orders. As directed by the plant's main process monitoring and reporting system, options such as paint colors, fabrics, tires, engines, transmissions, and electronics are queued into the parts delivery systems and presented to the appropriate vehicle. FloStor is proud to be the premier automation systems contractor for NUMMI, and pleased to be able to contribute to the continuing success of the plant. FloStor has a thorough understanding of TPS and has adopted TPS practices throughout FloStor operations, bringing a synergy to the working relationship so that NUMMI can rely on FloStor to solve automation challenges that meet their performance standards and fit seamlessly into the overall process. "Our standard is kaizan: Keep working at it to get it to where we need it," explains Dan Porter, Manager of Assembly Engineering. "It's hard to find companies like FloStor that are willing to meet the kaizan standard. In an assembly environment, field testing will always reveal shortcomings and modifications will be required. This is why the persistance of the people at FloStor is so valuable to our operation." From Toyota's perspective, the objective of automation is not to reduce labor cost. Though man-hours per unit remains an important benchmark, Toyota recognizes that in an assembly environment the highest quality control can be achieved by applying human judgment as conditions vary. "Totally automated systems require perfect conditions, and the assembly environment is hardly perfect", says Porter. Recent trends in the design of assembly processes have emphasized the flexibility and judgment offered by manual assembly over totally automated systems, and many of FloStor systems provide assistance to the operator. According to Porter, "Toyota has discovered that Preset Auto (PSA) processes can be more reliable, yield better quality control, and result in less downtime than totally automated systems. We are trying to uncomplicate things." Automation is implemented when warranted by: excessive weight, safety and ergonomics, and reducing cycle time. Many of the major systems, such as Daifuku Ramrun electrified monorail systems, are designed and fabricated in Japan and subsequently installed by FloStor. Automation projects designed, fabricated, and installed by FloStor are a product of collaboration between NUMMI assembly engineers and FloStor design engineers. Concepts are discussed, and NUMMI engineers issue a set of performance criteria. Development of the specifications and the ultimate system design is the responsibility of FloStor engineers. Automation systems typically can be described as a delivery system, a handling system, a presentation system or as a combination of these functions. Delivery systems convey components within a subassembly area or from a satellite process to the main assembly line. 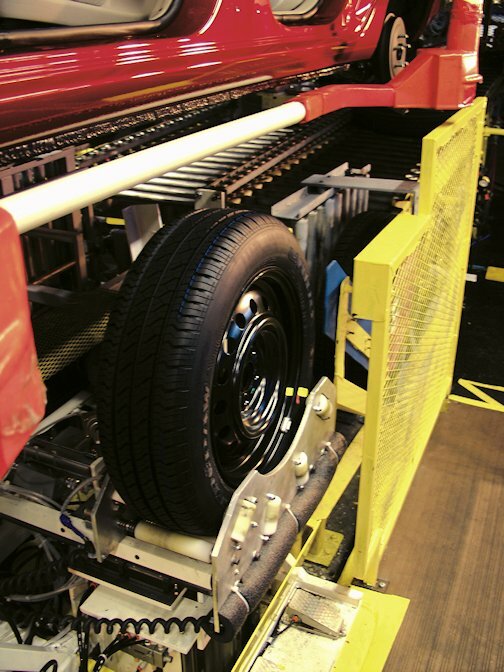 A handling system entails a fully-automated process either within a subassembly area or on the main assembly line. A presentation system is a Preset Auto (PSA) process that assists the operator by automatically positioning a component for manual installation. Custom dollies and racks are also designed and fabricated by FloStor as essential components of an automation system. This custom conveyor system services the output end of a stamping press line at the plant. In this operation, employees transfer stamped body components such as door panels from a stamping press to specially designed steel racks. Once a rack is full, it is moved at high-speed to a holding position. A lift truck operator will then pick up the rack and carry it to the body assembly line in another area of the plant. In addition to greater materials handling flexibility, the new system has substantially improved cycle times. Previously, it took approximately 30 seconds to cycle a rack all the way through the system; now the time required is in the order of 7 to 8 seconds. With load time, the result is a system output that typically averages two fully loaded racks every 1.5 minutes. The dual outfeed conveyor lines also mean that it's easier to accumulate full racks prior to transport to assembly, which takes some of the pressure off of the lift truck operators. 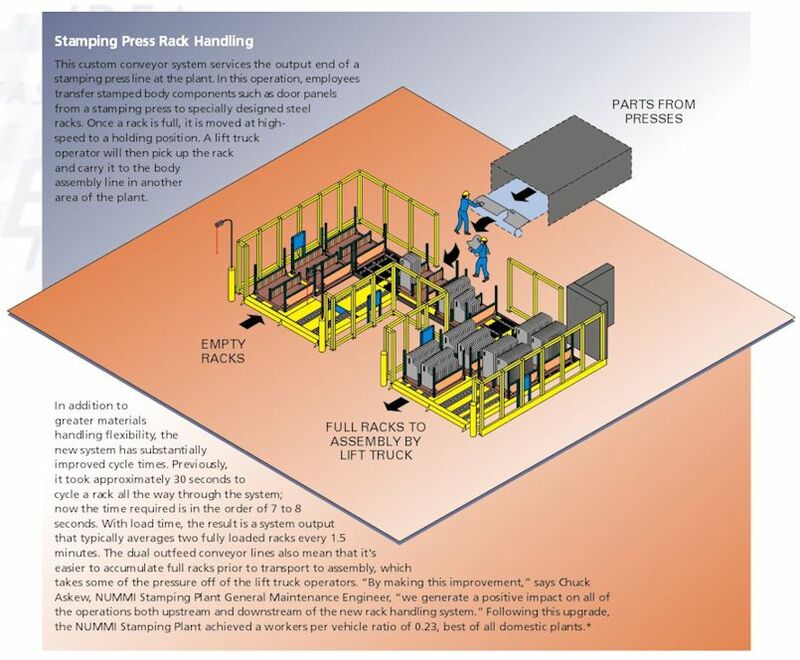 "By making this improvement," says Chuck Askew, NUMMI Stamping Plant General Maintenance Engineer, "we generate a positive impact on all of the operations both upstream and downstream of the new rack handling system." Following this upgrade, the NUMMI Stamping Plant achieved a workers per vehicle ratio of 0.23, best of all domestic plants. 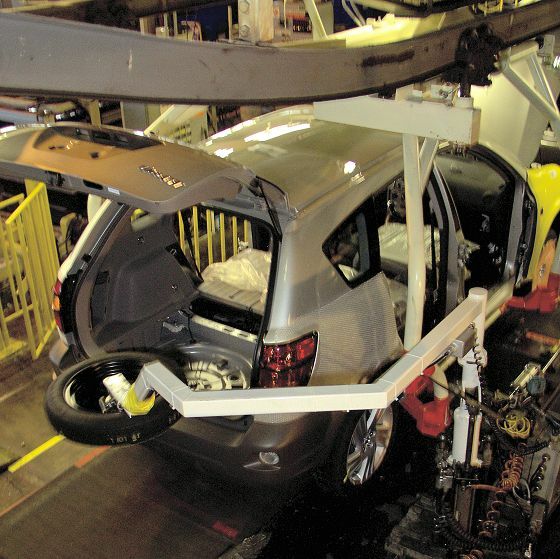 FloStor provides automation systems for major NUMMI suppliers as well as for Nissan and Ford. 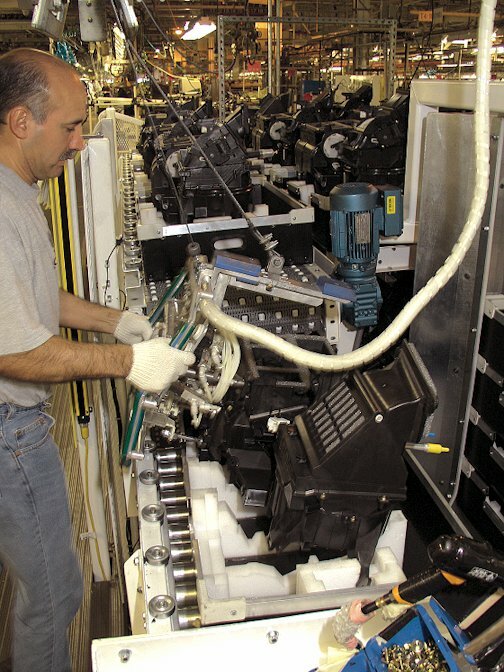 Johnson Controls provides seats for all vehicles assembled by NUMMI, and FloStor provides the delivery and presentation system equipment for the Johnson Control seat assembly plant in Livermore CA. FloStor designed and fabricated custom racks for Injex Industries, Hayward CA, a major NUMMI supplier of plastic components including glove compartments, instrument panels, and door components. To be a successful JIT supplier of components for NUMMI, systems must be compatible with TPS. Suppliers recognize the value of FloStor's extensive experience with Toyota's requirements. As the lead times get shorter for each model roll-out, we rely on FloStor to fast-track a project. We have a solid working relationship, they are familiar with our operations, and they know our requirements. They understand TPS and how we want our equipment to function.